When it comes to social profiles, most ecommerce marketers choose to highlight their products on Instagram. But how can you turn your Instagram marketing into consistent sales growth for your online store? Instagram gets over two times the engagement on photos versus all other social platforms. You’ll also find that more than one in three internet users interact with social media to find more information on a brand or product. Due to this, ecommerce stores are turning to Instagram for not only engagement but also for launching ads. 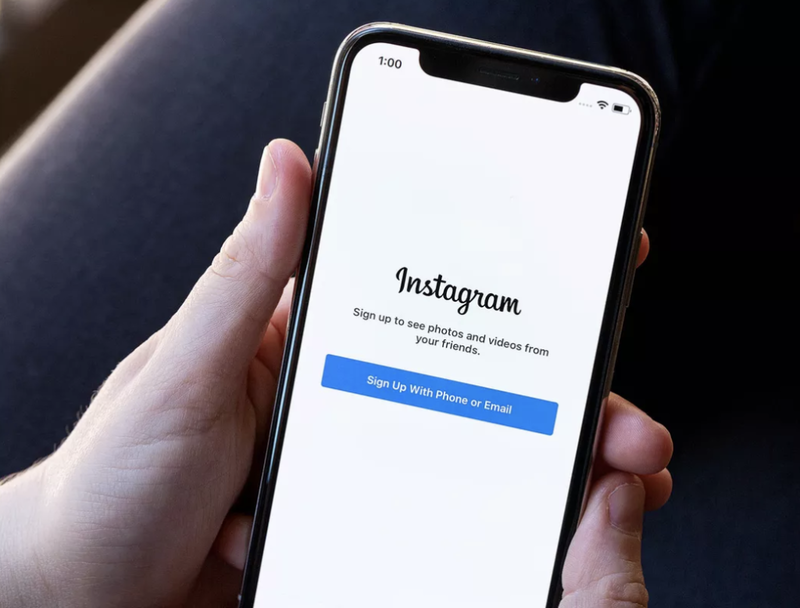 This process is made simple by connecting an Instagram profile with Facebook, making it easy to convert the Instagram profile into a business one. 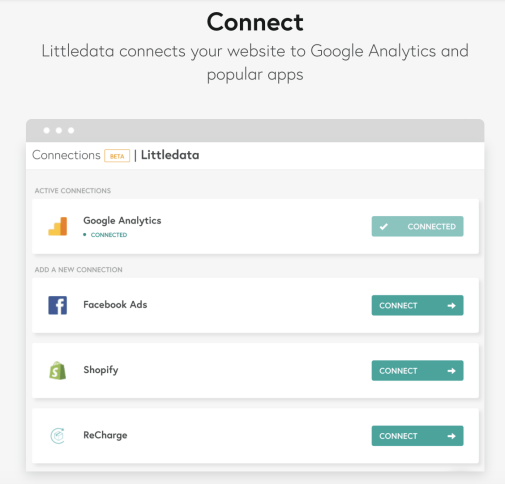 This allows you to launch ads on Instagram, while all the data is directly connected to your Facebook account. Once you’ve created a promotion you have the ability to send it to your Instagram profile, your website, or your Facebook page. You can also create Instagram promotions directly from Facebook’s self-serve advertising platform. Some of the benefits of Instagram advertising include scalable pricing, control of who you’re targeting, and instant ads. As with Facebook Ads, you can define the goals by reach, traffic, and brand awareness. Gone are the days when Instagram was used just for engagement, it’s now a frontrunner for sales. Below are the apps that we’ve chosen based on rankings and reviews. So here they are: the top 5 apps. If you’re using Instagram to market your brand, these can help you increase sales and customer lifetime value. Much like our previous post where we dug into 15 Shopify apps that would help you increase AOV, we’ve taken the same approach to look into 5 Shopify apps that can help you increase your sales and deliver results. We searched for top-ranked apps to give you the best tools and ensure your ecommerce site is using Instagram to its full extent. 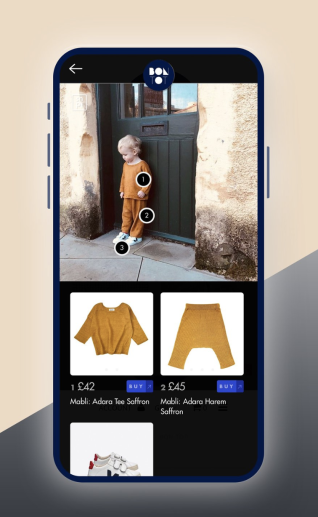 Snapppt is a free, Instagram approved app that allows you to make your Instagram feed shoppable. That’s right, shoppers can now buy directly from your Instagram feed – now shoppers can instantly click on a pair of earrings they thought were great and buy them. 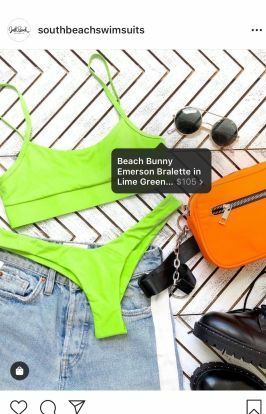 An example would be South Beach Swimsuits, in the image below you can see how within the photo you can view the product displayed and shop for that item directly from Instagram. 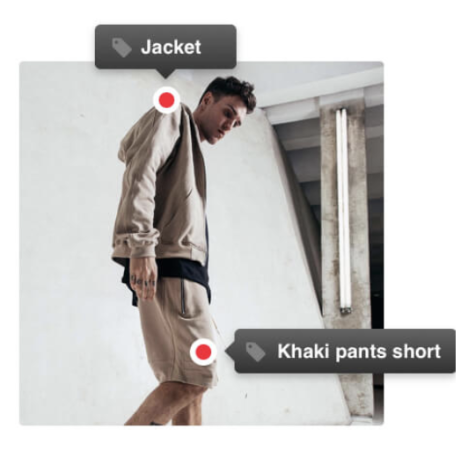 Snapppt also gives brands the ability to track their customers from the point of seeing an Instagram image all the way to checkout. While Instagram is testing out their own checkout, called simply Checkout, we still think Instagram shop is a better fit for Shopify stores. It’s a must-have for brands looking to add to their sales pipeline. Happy scrolling! 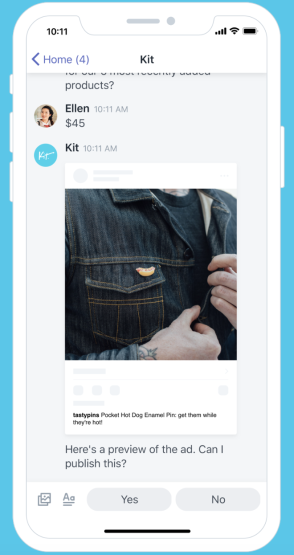 Kit is an official Facebook Marketing Partner that integrates with Facebook and Instagram. Kit’s been owned by Shopify since 2016, so obviously it’s a great fit for any Shopify store looking for smart automation! What is Kit? It’s a virtual marketing assistant that can manage your Facebook Ads, Instagram ads, social posts, and email marketing to help you drive sales. Need help creating discount codes and targeting customers? Kit is really helpful with that – all you need to do is communicate via SMS or Facebook Messenger. Just type in some commands and Kit will be ready for duty. It also works with other Shopify apps like Yotpov and Venntov. Kit will make your life easier when it comes to managing ads and can even help you generate reports for sales. Hire an assistant or get a free assistant with Kit? Tough choice, big reward. 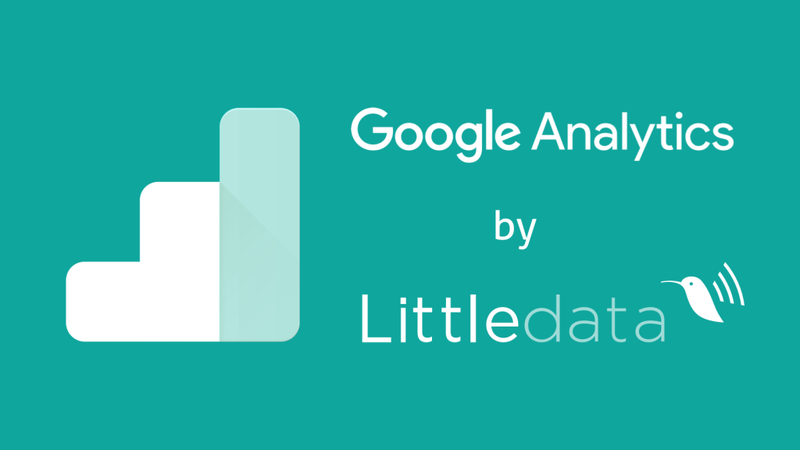 Littledata’s Shopify app fixes your tracking automatically and gives you accurate data. Once you install, all you have to do is connect your Facebook Ads account using our Facebook integration. 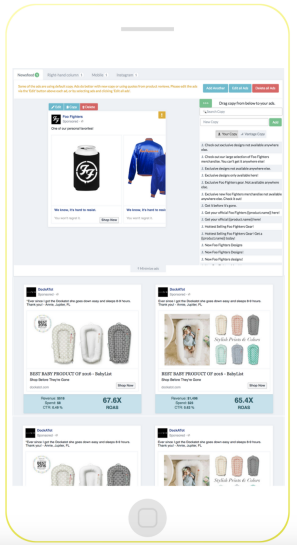 Using that Facebook integration, we’ll show you the real ROI of your Instagram ads – and connect ad performance to buying behavior, like adds-to-cart and recurring purchases. That’s right – since your Instagram ads data is found in Facebook Manager, all you need to do is connect Facebook Ads and you’ll get that data imported right into your Google Analytics account. Simple, right? That’s what we thought as well. After you connect, that data will be seamlessly pulled into your overall ecommerce tracking, so you can see if your Instagram promotions lead to purchases and conversions, or just a lot of ‘window shopping’. Vantage uses your Shopify data to help you better target and retarget audiences based on customer interests, behavior and purchase history. For example, if you sell sports clothes and health vitamins, you can automatically run Instagram ads aimed at people who are interested in health, vitamins and sports apparel. This makes sure that your ads are seen by the optimal shopper. Vantage helps Shopify merchants understand shopping behavior using insights from your store. It allows you to personalize content using highly targeted and automated Facebook, Instagram, and Google Ads, all of which Vantage integrates with. It also auto-optimises, so you won’t waste money on ads that aren’t performing well. It will reallocate your budget so that you’re focusing on the right channels and best placements. Vantage allows you to target ads based on demographics, interests, as well as online behavior – leading to even better results for your Instagram ads. With more successful ads you’ll be able to bring more people to your site and your Instagram page. Stamped.io Reviews takes your customers words or content and uses it to increase your sales. It’s an easy three-step process as you can search Instagram for the photos you want to add to your gallery, tag them with items from your store and showcase those by creating a gallery. You have complete control over the contents of the gallery, which can includes images that are posted by customers. As people are interacting with your Instagram feed or the gallery on your site or blog they are able to see the products in one place instantly. This also allows for a smarter marketing strategy as you’re using user content to your advantage to drive traffic. All of these Shopify apps add something special to make sure that your Instagram is performing at its best. They can lead you to a more successful marketing strategy due to smarter ads, ad cost analysis, and a directly shoppable Instagram feed. Let’s remember that Instagram has 58% more engagement than Facebook and 75% of Instagram users take an action after seeing an engaging post. You don’t want to miss out on those numbers, so optimise your Instagram for success today!